If you have an active lifestyle that includes a lot of time outdoors in the San Diego sun, an IPL photofacial, also known as a lunchtime laser procedure, might be the ideal skin rejuvenating treatment for you! 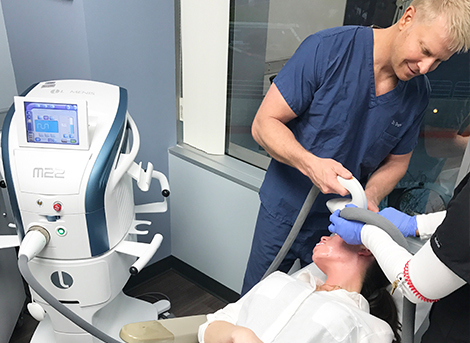 A minimally invasive procedure that entails little to no downtime, IPL, or intense pulsed light, uses high-intensity pulses of light to penetrate the skin and trigger your natural healing process, resulting in smoother, healthier skin. At Cosmetic Laser Dermatology, our board-certified dermatologists and physician assistant are proud to offer a comprehensive variety of 45+ laser treatments, including our most popular IPL photofacial devices Lumenis M22 and Lumenis One, to suit our patients’ unique skincare needs. Not only did Dr. Mitchel Goldman help develop the first intense pulsed light device for treating common skin issues, each of our six dermatologists have been involved in numerous research studies involving IPL, giving our team the most experience performing IPL treatments than any other practice in the country. 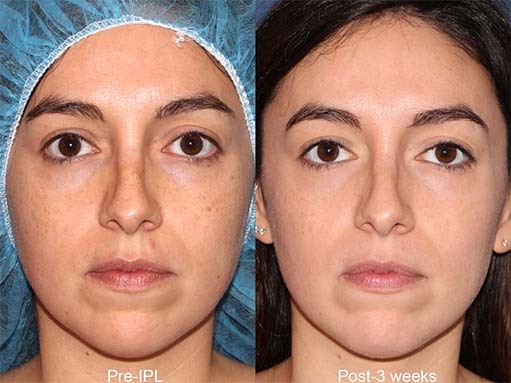 ncbi.nlm.nih.gov has more information on IPL photofacial treatments. IPL photofacials using Lumenis M22 or Lumenis One, are not solely for full-face photo rejuvenation; they’re excellent for improving the appearance of other parts of the body, as well, including the hands, arms, neck, and chest. A minimally invasive IPL photofacial uses a handheld device to shoot pulses of intense, broad-spectrum light to the treatment area. During a single 15 minute session, our skilled dermatologists will target areas of noticeable sun damage or other skin concerns. The treatment is fully customizable for different applications, skin types, and conditions. An IPL photofacial is remarkable in its efficiency. Your skin and subdermal tissue absorb the gentle yet penetrating light. If you’re having treatment for a vascular lesion, the light is absorbed by the blood. If you’re being treated for a pigmented lesion, the melanin in the skin absorbs the light and then naturally eliminated by the body. Most patients require zero downtime. Some patients may experience minimal and temporary side effects, such as swelling, redness, tenderness, and discomfort for 24-48 hours. Dark spots may crust up with a coffee grounds appearance before exfoliating from the skin surface. 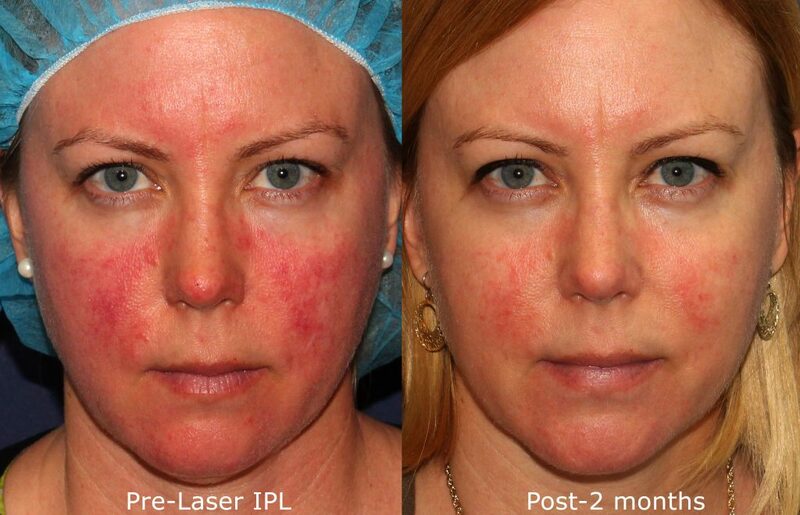 The effects of IPL are typically noticeable within a few days and they can remain for years with proper skin care and maintenance. For optimal results, we suggest 3 treatments spaced 4-8 weeks apart, followed by 1-2 yearly sessions for maintenance and upkeep. Read our pre/post treatment guidelines for intense pulsed light (IPL) therapy. 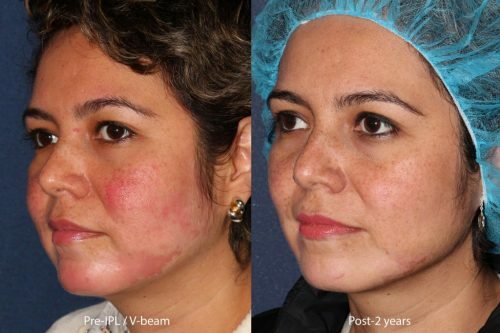 Dr. Fabi treated this patient with IPL/V-Beam to treat her rosacea. 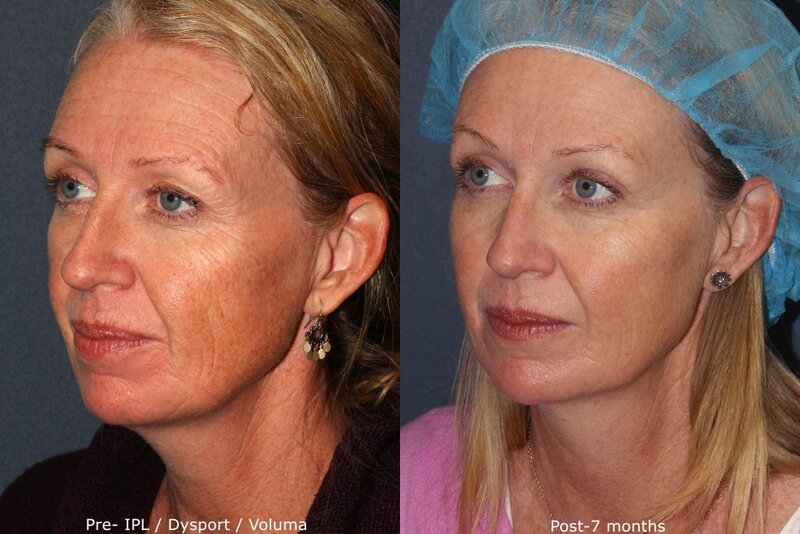 IPL treatment by Dr. Groff to address sun damage. Results are 3 weeks post-op. 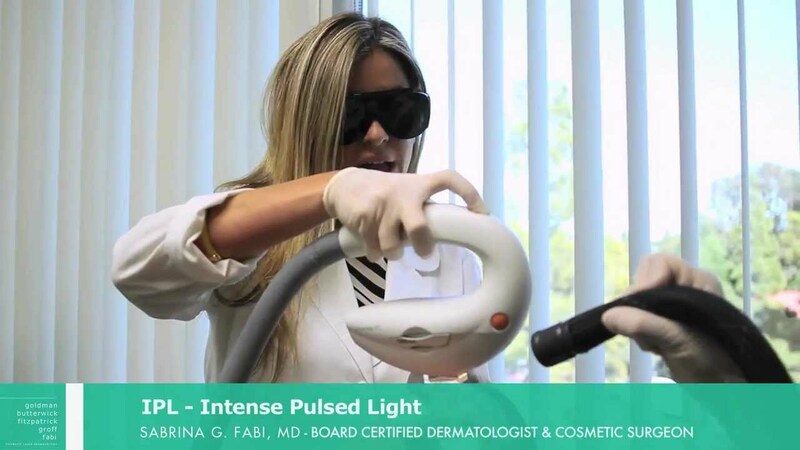 A: Intense pulsed light, or IPL, is a light treatment designed to improve the skin by penetrating deep to repair melanin-related issues or to minimize those involving blood vessels. An IPL photofacial delivers noticeably smoother, fresher, and healthier skin. A: Generally, since a cooling gel and cold air is used during treatment, most of our patients report minimal pain; the most common description is that the laser feels like a rubber band snapping on the skin. 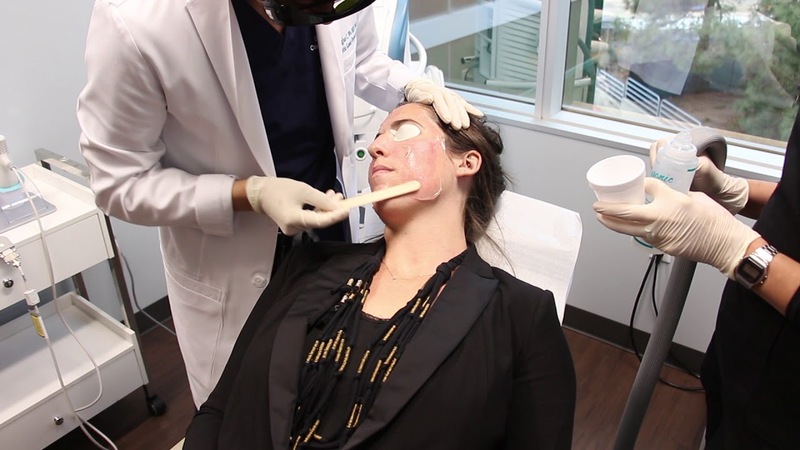 A: IPL treatments are usually performed within 5-15 minutes, although this can vary depending on the extent of the treatment you are undergoing (e.g., how broad an area or the number of areas being treated, etc.). A: The number of IPL sessions you require depends on your aesthetic goals and the condition of your skin. Typically, you can expect a series of 2-3 treatments every 1-2 months. Touch-up sessions may be necessary every 6 months to maintain your desired results. Q: What can I expect post-treatment? A: After an IPL photofacial, little to no recovery time is needed. After a treatment session, you can go right back to work or whatever your plans are for that day. Any postoperative redness is to be expected and will fade naturally. A: Before undergoing an IPL treatment, the skincare specialists at CLDerm will discuss with you the proper aftercare techniques that help prolong results. A simple rule of thumb is the following: the better you care for your skin, the longer the results will last. Many of our patients have seen their results last for several years, coming in every year to touch up age spots or to simply rejuvenate their skin. Q: Is an IPL photofacial effective for all skin types? A: An IPL photofacial treatment is effective for all skin types. Q: Is IPL effective even when you have a tan? A: An IPL treatment is not recommended for patients who have a genuine tan from the sun (exposure to UV rays) or even a fake tan (sprays or lotions) because the light cannot differentiate between the tanned surface skin color and the darker pigmentation at deeper layers of the skin. Even a minor tan can cause unwanted side effects, such as blisters. Patients should allow the tan to fully fade over a period of 2 to 4 weeks prior to an IPL treatment. A: IPL photofacials have a strong track record of safety. Typical side effects are temporary and include mild swelling, soreness, tenderness, and redness or irritation. Q: How much does IPL photofacial treatment cost? A: Because an IPL treatment is customizable, the cost varies from patient to patient. 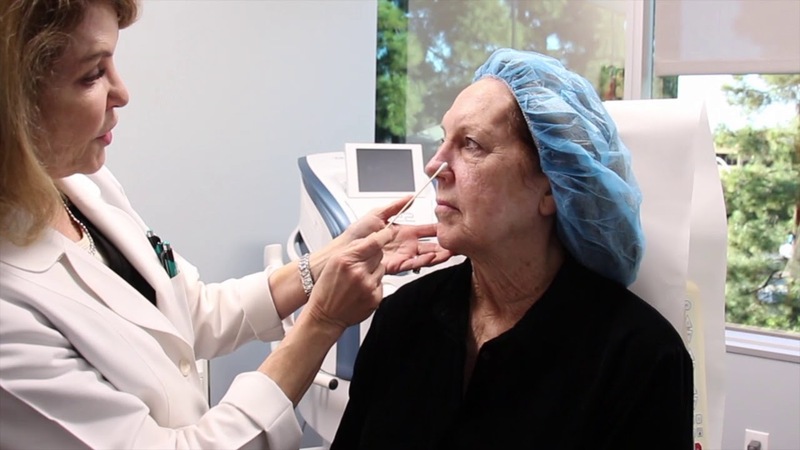 For example, if you have treated over a small area and/or for just a few age spots, your cost for treatment may be lower than for another patient undergoing more extensive treatment or having many areas being treated. Contact our dermatology experts today to learn more about pricing and financing for our skin care treatments. Q: Will an IPL treatment increase photosensitivity? A: No. If you are more sensitive to light than you were before treatment, it’s possible that certain medications or topical skincare products are contributing to this change. In any case, we always advise that you cover up as much as possible when in the sun, particularly following an IPL photofacial. Hats, long pants, long-sleeved tops, and broad-spectrum sunscreen are your best defenses against recurring damage. 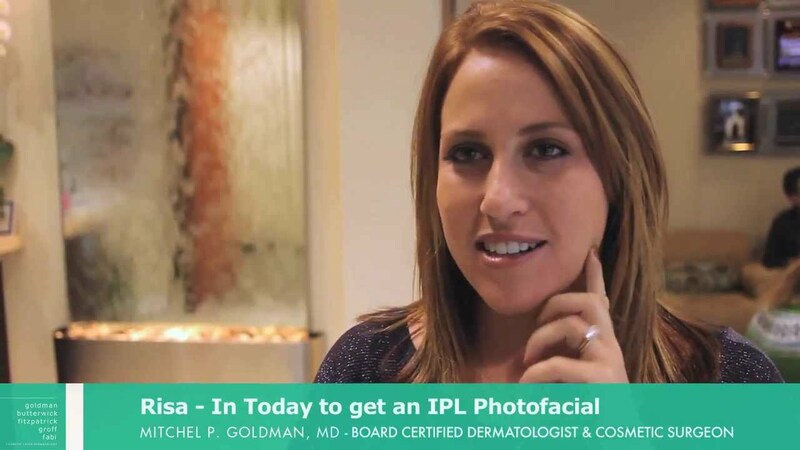 Q: Is IPL the best treatment for uneven skin tone? A: The best way to know this for sure is to see your trusted neighborhood dermatologist. Q: Does IPL always work for freckles? 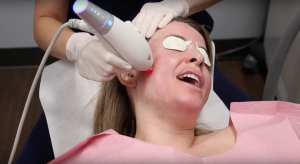 A: IPL’s efficacy against freckles depends on a number of factors, including your skin type, the kind of freckle you want to be treated, how your skin reacts to laser energy, and the skill/technique of the practitioner performing the procedure. For the best advice, schedule a consultation with San Diego’s Cosmetic Laser Dermatology. 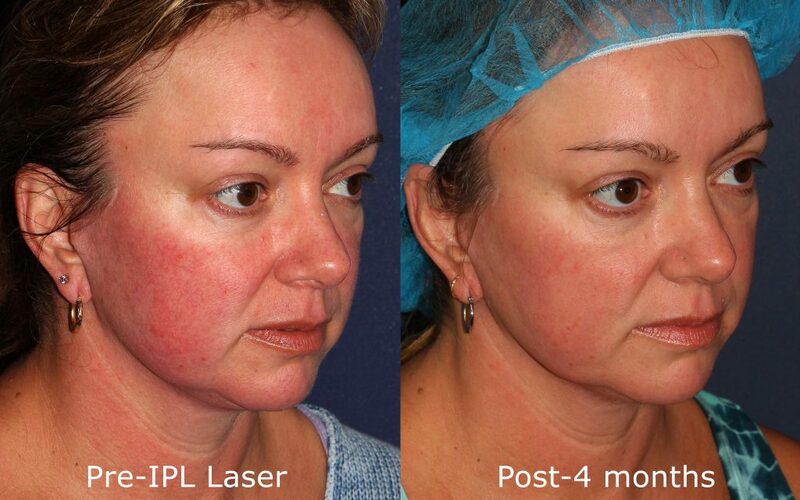 Q: What is the difference between IPL and laser resurfacing? A: IPL uses a broad spectrum of light to target a variety of skin concerns in one session, while laser resurfacing uses a single wavelength of light to deliver precise energy to specific skin tissues. 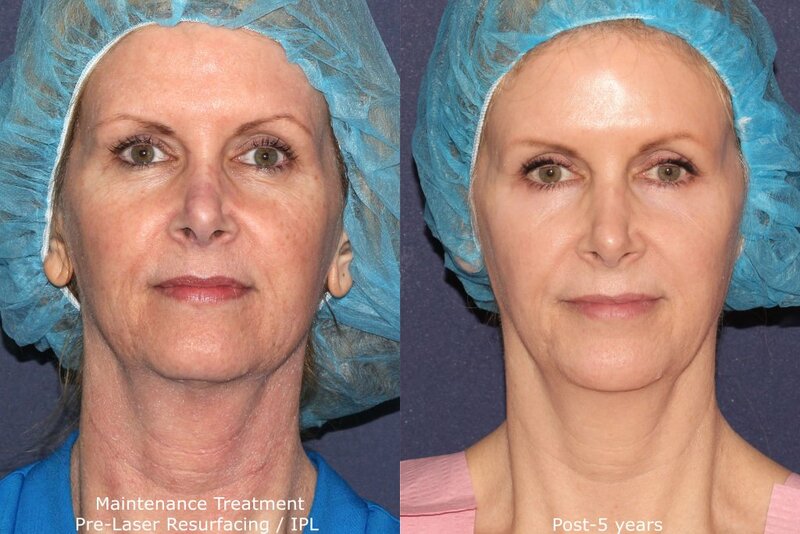 IPL is typically a gentler process compared to laser resurfacing. 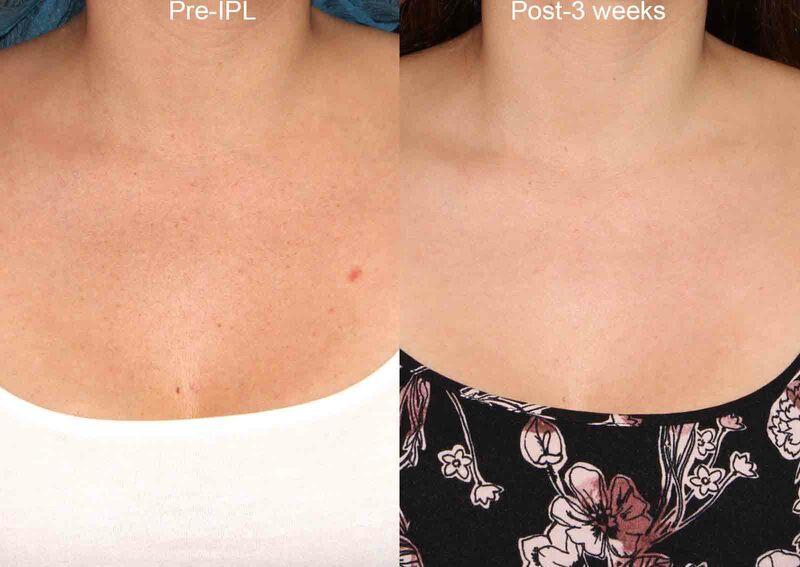 Clear + Brilliant is a great alternative to IPL for pigmented lesions. It is considered a gentler version of a traditional fractional resurfacing treatment. Clear + Brilliant noticeably improves hyperpigmentation, brown spots, sun damage, and large pores without damaging the skin. 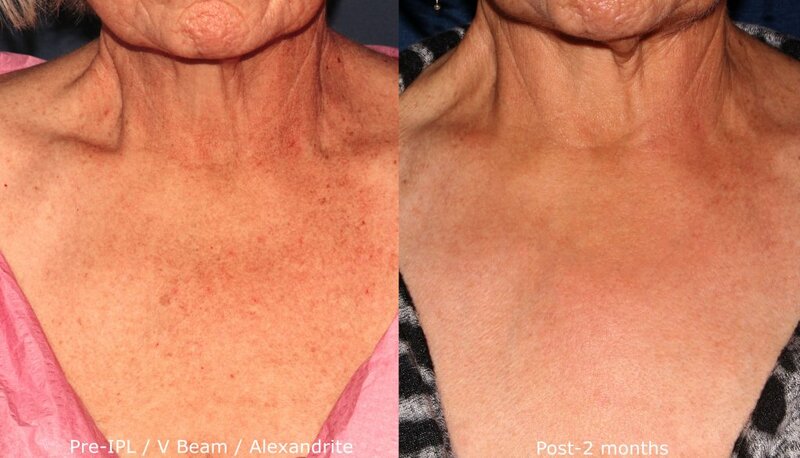 A Pulse Dye Laser (V-Beam, Cynergy) is an alternative to treating blood vessels or excessive redness of the skin. Although an IPL photofacial treatment is an excellent standalone treatment for a variety of skin conditions, it can be combined with other procedures for even more enhanced results. Along with simple proper skin care, these can include chemical peels, various types of non-invasive lasers treatments, and injectables. To learn which expert cosmetic treatments will work best for you, contact Cosmetic Laser Dermatology today.